A coalition of 16 states are suing the Trump Administration on the grounds that his actions are unconstitutional. On Feb. 15, the Trump Administration declared a National State of Emergency. In an effort to avoid another government shutdown, President Trump signed a budget bill; however, he has managed to circumnavigate the Congress by declaring the National State of Emergency to ensure he gets his long-promised border wall. More specifically, Trump gained access to the military construction fund, an account designated for the construction of military bases and other projects. This fund was used previously by President George H.W. Bush in 2001 when he declared a National State of Emergency following the attacks on Sept. 11. Secondly, the Federal Budget approved 1.3 billion dollars, a compromise met by the White House and Congress. Most importantly, this plan relies upon two executive departments: the Department of the Treasury and Defense. The Treasury will be providing an approximate 600 million dollars in the form of property seizures, and the Defense Department brings 2.5 billion dollars to the table, by organizing the amount as efforts to end drug trafficking. In total, all of these sources will add up to an estimated 8 billion dollars, which almost 2.3 billion dollars more than Trump was requesting. Although economic limits won’t constrain the Trump Administration, they are still facing another obstacle: legal ramifications. 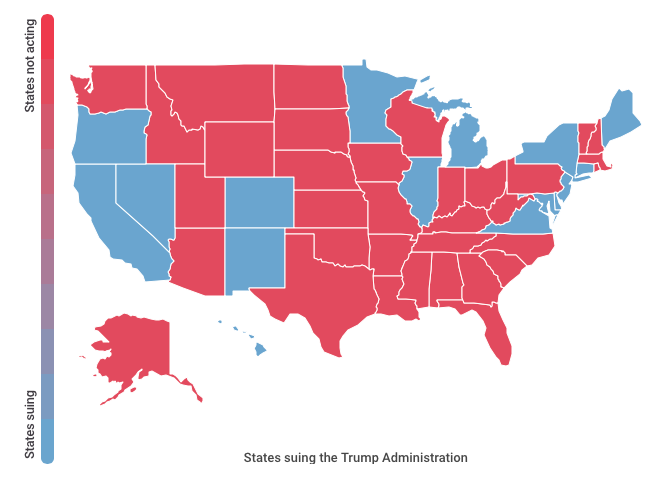 As of now, 16 states including California, and Colorado have filed suit against Trump, claiming that the President has overstepped his executive power and are damaging the local economy by pulling away resources used in their state. For instance, Colorado is asserting that drawing resources from the military construction fund will impair their ability to maintain several military bases, and academies. Ultimately, the Courts will have to decide whether or not Trump is within his powers to declare this emergency. Meanwhile, Democrats in the House of Representatives have drafted a resolution that nullifies the National Emergency Declaration made by Trump. However, this bill will have to pass through the Republican-controlled Senate, and attain a two-thirds majority in the House to survive a Presidential veto. An unlikely feat because many House Republicans support the President’s actions, with only 13 representatives defecting to the other side of the aisle in the most recent vote to pass the resolution mentioned above. Ultimately, the chances of Congress to overrule Trump’s declaration are looking meager, leaving the Democrats with only one hope, that the Courts to rule in their favor. Each of the cases filed against the Trump Administration will garner much attention from the media and will most likely reach the Supreme Court’s docket. In which case, this will be one of the first major decisions that will be made with the current Republican majority on the bench after the appointment of Kavanaugh in 2018. Not only will the media attention surrounding the border wall affect the Supreme Court, but also the 2020 Presidential Campaign. Trump will most likely use this declaration and the subsequent as a launching point for the incumbent’s platform.